Bush hooks or bush bait hooks are fishing lines with a hook attached to overhanging branches over a waterway and allowed to sink into the water. This owl was photographed off a small creek branch just before entering Womack Creek, Tate’s Hell State Forest. It had been caught on a bush hook and became entangled in the overhanging tree branches. 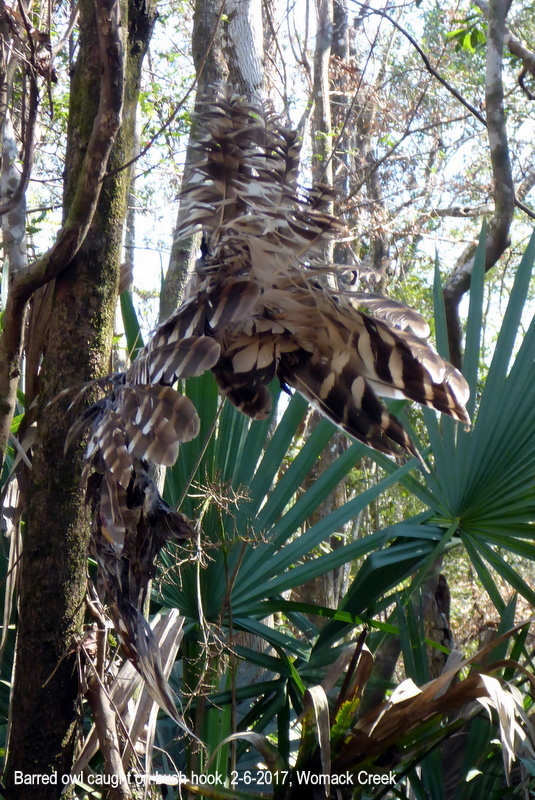 The Cornell Ornithology lab says that barred owls are thought to mate for life. They nest in tree cavities. They have one brood a year with the female laying 1-5 eggs. They prefer older forests. When tent camping in Womack Creek campground, campers used to hear a pair of barred owls calling to each other from dusk through the night. It is a lulling sound and you could have found yourselves falling asleep, listening to these calls. A few weeks later, we returned to the campground to camp. We did not hear the owls’ call. This entry was posted in Tate's Hell State Forest, Tate's Hell State Forest birds, Tate's Hell State Forest camping and tagged Birding - Tate's Hell State Forest, Tate's Hell State Forest on March 7, 2018 by marylynanded. A low spring tide exposes the shoreline and prevents paddling up branches. But, it attracts shoreline birds — like this little blue heron. It was cold that day. The the spring colors were promising of warmer days to come. With the creek beginning to bloom, we will visiting at least twice a month. A warm or a cold spell can change the array of blooms within days. This entry was posted in Native Wildflowers, Paddling Tate's Hell State Forest, Tate's Hell State Forest, Tate's Hell State Forest birds, Tate's Hell wildflowers, Womack Creek and tagged Florida birding, Florida native wildflowers, Tate's Hell State Forest, Tate's Hell State Forest paddling, Womack Creek on November 19, 2017 by marylynanded.